The DBD Marine CD 300 Outdrive has been designed for use in Australia's rugged coastal waters and inland lakes, where underwater clearance and strong, rugged design is critical. The DBD Outdrive can be lifted hydraulically enabling the vessel to be driven with the outdrive level with the keel of the vessel, which enables use in water as shallow as the draw of the vessel itself. 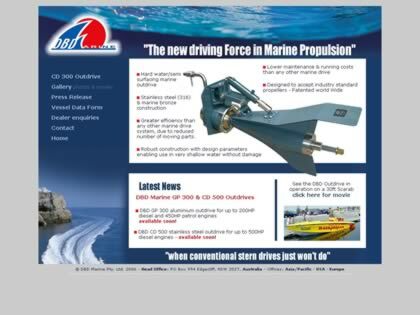 Web Site Snapshot: If available, above is a snapshot of the Outdrives by DBD Marine - Revolutionary New Outdrive Technology web site at http://www.dbdmarine.com/ as it appeared when this site was added to the directory or last verified. Please Note that Boat Design Net has no involvement with the above web site; all content and images depicted in the above thumbnail are the property and copyright of Outdrives by DBD Marine - Revolutionary New Outdrive Technology unless otherwise noted on that site. Description: The DBD Marine CD 300 Outdrive has been designed for use in Australia's rugged coastal waters and inland lakes, where underwater clearance and strong, rugged design is critical. The DBD Outdrive can be lifted hydraulically enabling the vessel to be driven with the outdrive level with the keel of the vessel, which enables use in water as shallow as the draw of the vessel itself.